Some of the links below are affiliate links. If you choose to shop through them I will make a small commission. Thank you for supporting Truncation! TR: jumpsuit. ethical option here. cardigan. shoes c/o NLA, similar here. B: Turtleneck: thrifted. Similar. Jacket. Denim. Mules. I know. I know I said I wasn’t going to do an outfit roundup anymore, but I took a moment to reconsider. I do still like the idea of an outfit roundup, but in a less formal way. there, I said it. I like blogging about style, and sharing it with you… just not in that way. 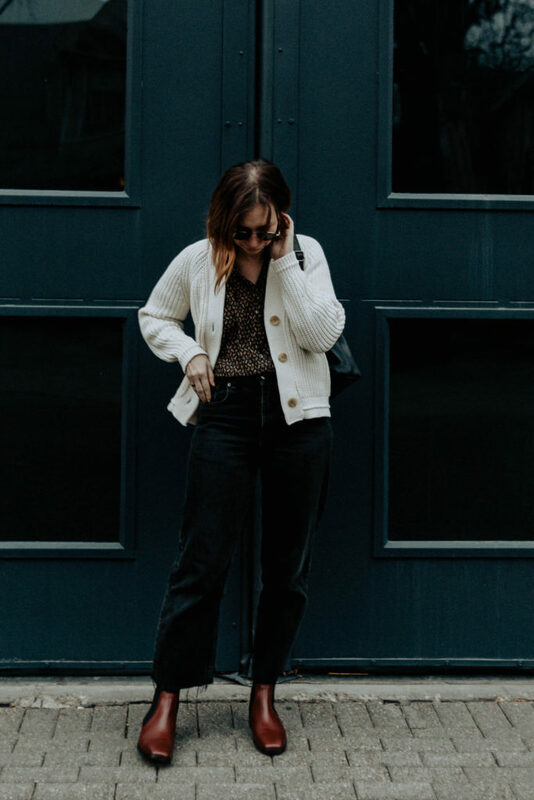 I’m going to share what I wore that week with some overall thoughts, and then I’m going to share some other things that I was into throughout the week. I’m probably the worlds worst blogger because I just can’t bring myself to do things purely for the numbers ha! If I don’t love what I’m doing, it’s just not happening. Which, I guess I’m really not that sorry about. Blogging has always been about me doing it because I like it, and if I find myself not liking it then adjustments must be made. Last week was an interesting week for clothing to be honest. I started out the week feeling really motivated, and then… everything just dwindled as the week progressed. Ella and Rosie were teething, we were working on getting Kit into a quiet afternoon routine with the dropping of her naps, and then I got a pretty intense head cold towards the last part of the week. And poor David. It was his birthday over the weekend, and we were all a crabby mess. But my outfits reflect the need to be comfortable, while still having to be dressed as we had things going on that required clothing (SUCH a bummer when clothing is required). First: Did you see Doen’s new spring line? I’m pretty much smitten with all of it. I have one of these tee’s on my wish list for later in the spring, and I was also eyeing up these overalls. After a little reflection, however, I realized that I could probably find a similar pair vintage… and find them I did! 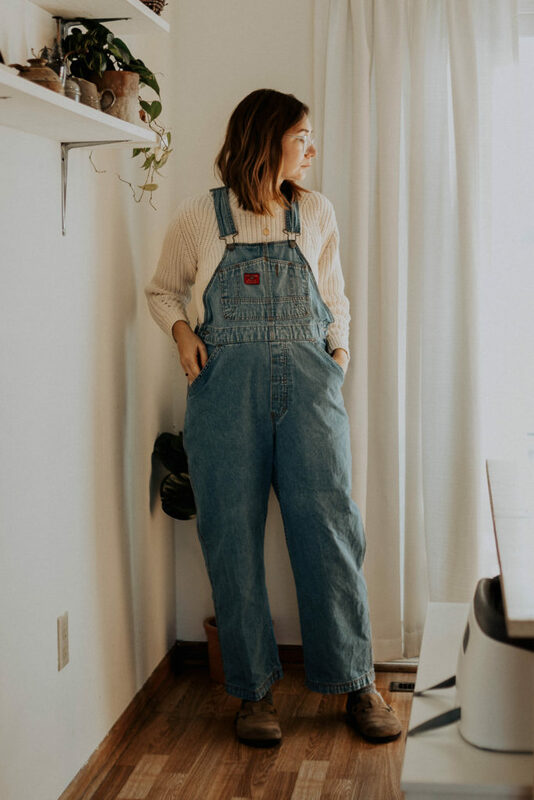 If you’re also eyeing up those overalls, but can’t swing the price tag, type in “90’s vintage overalls” into a search query on eBay, Etsy, Poshmark, etc. and you’ll get some good options. I find vintage Gap or Union Bay to be the closest to the Doen vibe if you want to narrow it down even more. Second: I finally jumped on the Nisolo Mariella Mule bandwagon. I know it seems like every single ethical fashion influencer on Instagram owns a pair of these, and for that reason I held off (even though I really love their vibe). I wanted to make sure I wanted them because they truly would go well with my wardrobe, and not just because everyone had them. After about two years of thought, I finally went for it and I can honestly say I’m glad I did. I probably won’t get a ton of wear out of them right now (although I did really love pairing them with socks), but I got them on sale at Christmas and I know I’ll get a ton of wear out of them once weather turns warmer. Would you be interested in a review? Let me know in the comments. 1 | I’ve been trying out some new skincare now that the weather is a lot colder, and I’ve been really loving this oil, night cream, eye cream triple threat. I find the formula to be hydrating, but not pore clogging which is a hard thing to find with anti-aging products. 2 | speaking of hydration: I’m still loving this lip balm. I’ve been using it ever since I was pregnant with Ella and Rosie and I really don’t see myself using anything else ever again. It’s so hydrating, and while it’s thick it sinks right in. 3 | and for a final beauty mention: I’ve been a long time user/lover of Kerastase hair products, but over the last couple of years I’ve been on the hunt for a more natural option that even remotely compares. I have… troublesome hair. I don’t hate it, nor am I insecure about it, but it’s very fine, and it gets very greasy. Most shampoos I use (with the exception of Kerastase) either turn it into straw or weigh it down immediately (and before you mention the no poo method , it’s just never going to happen). Lately, I’ve been trying a couple Aveda shampoos, and while they don’t necessarily do as well as Kerastase, they come pretty darn close… plus they’re much better for me so I’m willing to compromise. The two lines I’ve tried are the pure abundance (volume) and the damage remedy. Major bonus: they smell amazing! 4 | I’ve been really into podcasts lately. My favorites? This one, which focuses on Christianity and Culture (this one is a must if you are a Christian), and… I know, I know. I’m super late to the game… the original true crime podcast Serial (we’re still on season 1). Instead of watching a movie or show after the girls’ go to bed we’ll cuddle on the couch with our drink of choice (herbal tee for me and hot cocoa for him because we’re old now) and listen to an episode. I’m so torn as to whether or not Adnan did it! For those who have listened, what do you think?? 5 | The girls have been LOVING these magnetic tiles (I can’t emphasize enough how much they’ve been loving them). They will stay busy with them for such a long time… which means I get stuff done. A win for everyone! We have the off brand, and they are so much more affordable, but just as good (in my opinion). 6 | Poor Oscar (our mini dachshund) would be mortified if he knew I was telling you this, but he’s been having some… incontinence issues lately. He’s kind of a stinker though because he’s been relieving himself when he’s angry at us (like when we leave him home alone). How do I know it’s intentional? It’s teeny tiny little pee spots all over Ella and Rosie’s rooms… and if I close the door when we leave he pees right outside of their rooms. So I ordered him some diapers haha! They’re little fabric strips with pads on the inside that you attach where you would a diaper. The idea is that if the dog pees, he has to sit in his pee (not for that long, 20 minutes tops… or I suppose longer if he does it while you’e gone) so that he gets over his “urge” pretty quickly. We haven’t tried them yet because he’s been pretty good lately, but they’re there for the next stretch. 7 | 90’s inspired dresses from one of my favorite brands are making me feel nostalgic. I especially love this brown linen style, and floral option. 8 | and finally, I’ve been really enjoying seeing the style of my friend Gillian blossom over the last year. 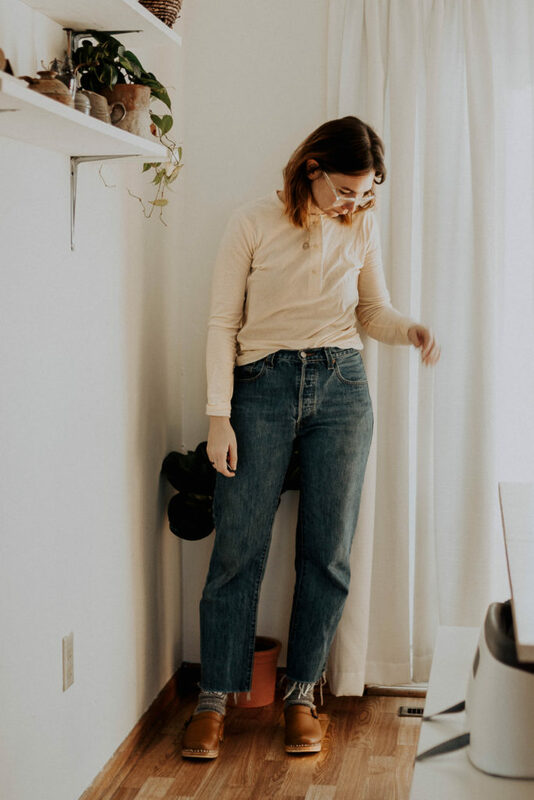 You can see her weekly roundups, and other ethical fashion musings/reviews at her blog Uncomplicated Spaces. And that’s it for this week! I hope you guys have a good weekend planned. If everyone is feeling better tomorrow, we’re going to try to go to the Minneapolis Institute of Art with the girls. It’s supposed to be above freezing so we are getting OUT of the house haha! What do you guys have planned? I always like seeing your outfits, so I’m glad you’re still sharing them! 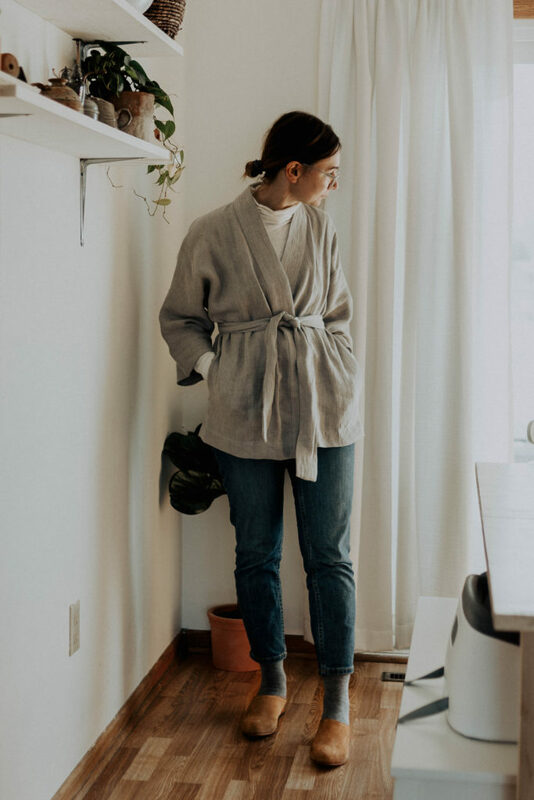 I have those Nisolo mules (going on quite a few years with them actually!) and I still love them. They are one of my favorite shoes (when the weather permits). They make every outfit look better. I hope you love yours for a long time. On the hair, mine is very similar to yours. I hate it. But I have been using Public Goods’ shampoo and conditioner for the last few months with great results! And the price is so good too. And I can’t survive a day without dry shampoo. I spray it in my hair before I go to bed at night. Magnetic tiles – we got our son some for Christmas and he’s played with them every day since! No exaggeration. I should have bought them a long time ago! I do get nervous about the magnet part though. Thankfully my kids are better about putting stuff in their mouths now. Thanks Andrea! I do really enjoy how they complete an outfit. I hadn’t heard of public goods before, but now I’m intrigued! Such an interesting concept. It’s crazy how much use my girls have gotten out of them too! It’s been every day for us as well. Super curious about those NIsolos!! I’ve been trying to decide if I should take advantage of their Valentine’s offer. My husband has a couple of pairs, but I’ve held off for myself. I really love them! If you ended up getting them, I’m sure you’ll love them! I totally feel you on everything you wrote here! 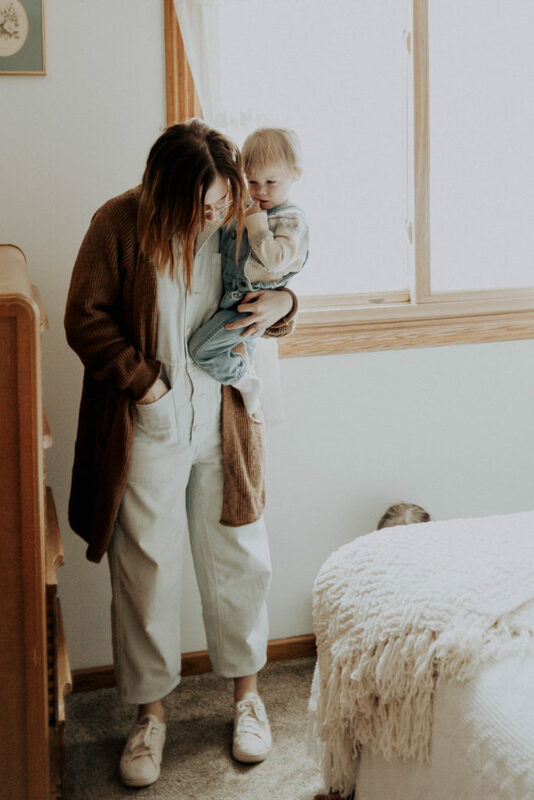 I really enjoy seeing your outfits, whether there’s a styling description attached or not, and I always relate to your general musings (my kids were also big fans of those tiles). And thank you so much for your sweet words, friend! Thanks Gillian! I find doing things for myself, and not for others always leaves me much happier with my space here. And you’re welcome! It really is fun to see your style bloom! After you finish Serial you need to listen to season one of Undisclosed. It goes way more in depth about the case. It’s even better than Serial! OOOOH thanks for the tip! It’s such an intriguing case!